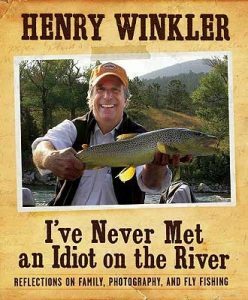 THE FIRST THING YOU NOTICE about Henry Winkler’s new book is its incredibly generous title. The second thing is that its dewy-eyed author is none other than the Fonz. Third thing: Winkler’s nonjudgmental magnanimity appears to be genuine. The book’s subtitle is Reflections on Family, Photography, and Fly-fishing. It’s obviously not a how-to, and it’s definitely not Tolstoy. So who might want to read it? Well, I think there are at least two categories of potential readers. First, if you’re new to fly-fishing, and find it complicated or frustrating or beyond your abilities, this book will help you see beyond your nightmares of tangles and dragging flies and snagged trees. And second, if family members are wondering whether there’s any meaning to your pursuit of trout, this book will reassure them (and you, on your darker days) that it is indeed worthwhile. Winkler was raised in Manhattan and now splits his time between New York and Los Angeles. But oddly enough, he doesn’t seem to act like a souped-up type-A city dweller until he gets on the river: apparently he’s calm and collected in his chosen cities and only loses his composure when he’s fishing. (He shares a nice pre-fishing shoe-throwing incident in the book.) His rivers of choice are located in southwestern Montana and the greater Yellowstone area (no surprise). So, if you’re fishing there and run into him, look out. The first chapter also contains a noteworthy photo of Stacey holding a nice trout in her gloved hands. The amazing part – her gloves appear to be leather. That’s a new one; no Glacier Gloves for her. The six remaining chapters are Winkler’s own, and they are an unusually unguarded bit of writing. Winkler is candid about his insecurities and limitations, and his struggles to overcome them. There is plenty of self-mockery, but no self-protection, and the book is refreshingly free of irony. Winkler seems to realize that there’s no joy in scornful irony, nor is there any shame in open enjoyment of life’s simple pleasures. The book is suffused with a gentle humor, homey anecdotes, and startling humility. For example, Winkler apparently falls in the river at least once a day. This should endear him to many readers. As for the homey anecdotes, here’s an example: Winkler says he read somewhere that “the sound of rushing water at eighty decibels is the most soothing sound to mankind.” There’s no effort to verify this, and really whether it’s true or not is totally beside the point. It just feels true, and that’s enough. Winkler also draws many analogies between trout fishing and life, and while none of the analogies is necessarily earth-shattering, most all of them ring true. And it seems like every life lesson improves Winkler’s fishing, and his time on the river improves his life. Sound familiar? Overall, this book is a quick read, and it’s frequently amusing. It does not pretend to be anything more than its subtitle suggests. It paints a clear picture of a fanatical fly-fisherman, someone who’s single-minded in his pursuit of trout. It also showcases Winkler’s focus on family (not in the political sense). And speaking of family: if you are a father, there are some insights and observations that will probably strike a chord – though be forewarned that some of Winkler’s fatherly anecdotes will likely make you feel like a bit of a heel. Not only is Winkler the Fonz, but he is apparently just about the most aware, reflective and attuned father of all time (with the exception of my own father). Buy “I’ve Never Met an Idiot on the River” in the MidCurrent store.